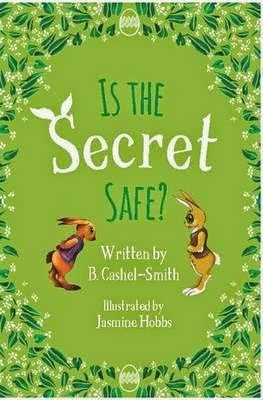 Buzz Words: Is the Secret Safe? An unusual book in so many ways! A chapter book of over 100 pages is not normally targeted at pre-schoolers and early primary readers. This is definitely a chapter book for confident, persistent and independent readers in that age group. The style is equally unusual and features significant sections of authorial intrusion via direct address to the reader from a wise old rabbit narrator. This kind of feature is not currently in vogue, probably because it needs to be handled with exceptional humour and subtlety to pass muster with the tech-savvy kids of today. In addition, the grammar and punctuation surrounding the dialogue, while not wrong, is certainly different with its frequent run-ons. Those minor reservations aside, this is a rabbit-warren of a book that romps along in a nostalgic style, reminiscent of the golden era of late nineteenth century children’s literature. The story is perky and unexpected, and follows the adventures of George and Matilda, who, having encountered Oscar, the son of the Easter Bunny, are invited to the secret town of Bunny-Hop. Jumping into a bush and down a dark hole, they come to an old door with an Easter Egg handle. The Easter Bunny is crosser than a hot-cross bun when he sees them. Oscar has endangered the secret location of Bunny-Hop. Worse still, he’s lost the Easter key – the key that can open any door anywhere to allow the Easter Bunny access to any home to deliver chocolate eggs. Oscar denies all knowledge of the disappearance of the key. It soon transpires that a wicked duo of hares want to take over and replace the Easter Bunny with the Easter Hare. Will they succeed in their dastardly scheme? Can Oscar stop them before it’s too late? What role will George and Matilda play? Why does the fairy helper keep fainting when she’s needed? And is the secret of Bunny-Hop safe? For the answers, turn to Is the Secret Safe? The book also contains simple recipes. Its lustrous illustrations will appeal to fairy fans.